The American Hotel & Lodging Association (AHLA) is a U.S.-based trade group that represents the lodging industry, which includes chain and independent hotels, real estate investment trusts (REITs), and companies that manage and supply the lodging industry. AHLA is based in Washington, D.C. and is connected with a network of state-level associations across the U.S. AHLA has become a powerful force lobbying against higher wages and greater health care coverage for its workers, and in 2014 filed a lawsuit against Los Angeles law to raise the wage for hotel workers to $15.37. AHLA's board includes members from major hotel and resort companies, including Omni, IHG, Wyndham International, Marriott, Hilton, Hyatt, Carlson, and others. AHLA's organization developed and rolled out a new brand strategy from 2012-2014, including a new "operating model" that foregrounds AHLA's "advocacy" efforts in lawmaking. Its stated mission is "[t]o serve the lodging industry by providing representation at the national level in governmental affairs, education, research, communications, diversity, and value-added services." 1.3 Spinning Minimum Wage Increases as "Extreme Wages"
A representative from AHLA, Brian Crawford, was one of the lobbyists instructing local officials at a closed-door workshop on "Local Minimum Wage" at the first meeting of the American City County Exchange, the local offshoot of the American Legislative Exchange Council. That meeting also included a workshop titled "Local Minimum Wage: a defense for small business and their employees." At the ACCE meeting, Crawford "urged conservatives to launch populist campaigns against wage increases by adopting the mantra that higher pay hurts ordinary Americans. It was crucial, he said at the meeting, to have 'the right face, and that's one of the things we’re focusing on… Not the Hyatts, not the Hiltons, not the Marriotts, but the small business people, telling their story about the American Dream -- the independently owned Holiday Inn, owned by an Asian-American who came to this country, put all their life-savings into it, and now they’re going to lose this business because they can’t afford a $15 wage.... The key component is the PR.'" Crawford also reportedly "likened the conservative battle against city wage increases to a game of Whack-a-Mole: 'We’re trying to beat them down when they pop up.'" On December 16, 2014 AHLA and the Asian-American Hotel Owners Association filed a lawsuit against the City of Los Angeles in an attempt to block a 2014 city ordinance that raised wages for workers at large hotels. As described by the L.A. Times, the suit "contends that the City Council's decision to impose a $15.37 per hour minimum wage is preempted by federal labor law and therefore unenforceable." The Center for Media and Democracy reported that the two groups "argue in the lawsuit that the city has created an 'insidious mechanism that improperly aids the Hotel Workers’ Union,'" and pointed out a similar suit in Seattle by the International Franchise Association. Also in 2014 a group campaigning against a minimum wage increase in San Diego, the San Diego Small Business Association, turned out to be bankrolled by industry groups like AHLA, which contributed $100,000, and the International Franchise Association, which contributed an additional $25,000. While the front group gathered enough signatures to postpone the hike and put the question on the 2016 ballot, its campaign used questionable tactics, with multiple local petitioners caught on tape saying that the petition was actually for a minimum wage hike. Spinning Minimum Wage Increases as "Extreme Wages"
O'Neill's report, issued in June 2014, argued, "Extreme minimum wage rates would not only decrease employment, but also decrease opportunities for upward mobility in the hospitality industry." O'Neill completed a program at the AHLA Educational Institute in 1998 making him an AHLA "Certified Hospitality Educator" and has worked in upper management for Marriott Corporation and Holiday Inn International and as a consultant for the industry with Laventhol & Horwath and Coopers & Lybrand. O'Neill regularly writes for industry magazines like Lodging Hospitality and Hotel News Now. 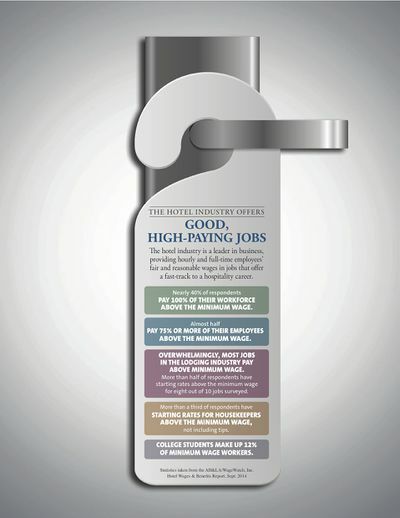 American Hotel & Lodging Association, Infographic touting "high-paying jobs" with many caveats. In its rebranding materials, AHLA touted its members' commitments to the "communities and small businesses we grow" and the "dreams realized" by people employed by the industry, even calling the industry "the American dream exemplar, with broad opportunity, ample education and certification, professional advancement, and pathways to ownership." AHLA claims that "[t]he hotel industry offers good, high-paying jobs with benefits and a fast-track to senior positions." (See infographic at right.) In September 2014, AHLA and WageWatch issued a "National Survey of Hotel Wages & Benefits," which surveyed hotel employers. It concluded that "most jobs in the lodging industry pay above minimum wage," "86.8% of respondents provide paid time off benefits to non-exempt workers," and that most employees are eligible for promotions and/or wage increases within a year of being hired. However, its own materials suggest that many of AHLA's "high-paying jobs" likely pay poverty wages only marginally above the minimum wage. Based on the state-by-state averages listed in AHLA's wage survey, "more than minimum wage" for housekeeping staff ranges from $7.77/hr in Mississippi (where the minimum wage is $7.25) to $10.58 in New York (where the minimum wage was $8.75 and will be raised to $9.00 by the end of 2015). For comparison, a Living Wage Calculator produced by the Massachusetts Institute of Technology (MIT) in 2010 estimated that the living wage -- the wage necessary for someone working full time not to live in poverty -- for a single adult with no children was $8.45 in Mississippi and $11.50 in New York. The numbers rise significantly for workers supporting families. According to the U.S. Bureau of Labor Statistics, the mean annual wage was $22,010 for hotel clerks and $21,800 for maids and housekeeping staff (in the travel industry) in 2013. AHLA opposes the "card check" process for unionization, National Labor Relations Board rules limiting campaign time (which AHLA refers to as the "ambush election" rule), and generally views the NLRB and Department of Labor as creating "an extremely anti-business climate." AHLA opposes raising the minimum wage and opposes local living wage laws, claiming that they place an "undue burden on employers – many of whom, like those of us in the hotel industry, already provide excellent wages and benefits." Its policy brief expresses concern over possible changes to overtime regulations, such as an increase in the pay level workers must earn in order to qualify as salaried employees. "AH&LA's governmental affairs team is staying in close contact with key members and staff in the House and Senate to emphasize the job-killing effects of living wage hikes while highlighting the track record of upward mobility in the lodging industry. "AH&LA also continues to aggressively track and build tools to help the industry more effectively combat local extreme living wage initiatives. These include a proposal in Los Angeles to increase the wage to $15.37/hour for hotel workers, among others. The industry is working closely with state lodging associations and members across the country to combat these actions by bringing every resource possible to this fight and ensuring that the industry is best and most effectively positioned to defeat them." AHLA opposed the 2010 PPACA (Affordable Care Act), citing what it claimed as "the significant number of new one-size-fits-all mandates that further drive up the cost of healthcare, the lack of any cost containment measures, and the lack of any meaningful provisions to assist small businesses in accessing affordable coverage." AHLA claims to support providing health care to hotel workers, but holds the position that the ACA is "burdensome" to the hotel industry. It has lobbied for a law that would establish 40 hours/week as "full time" employment with respect to the ACA, a repeal of auto-enrollment, repealing some tax provisions, and changes to the definition of "large employer." In addition to supporting visa access for foreign business travelers and tourists, AHLA supports some form of legalization for certain currently undocumented workers, retention of the H-2B seasonal worker program, and changes to the worker verification system. It also supports the "lesser-skilled temporary worker program." Its official position statement expresses concern about "harmful Labor Department actions through rulemaking" on the H-2B visa program. AHLA collaborates with the Essential Worker Immigration Coalition in this area. A representative from AHLA, Brian Crawford, was one of the lobbyists instructing local officials at a closed-door workshop on "Local Minimum Wage" at the first meeting of the American City County Exchange, the local offshoot of the American Legislative Exchange Council. In recent years, AHLA has made a concerted effort to expand its political influence. For example, in its 2012-2014 strategic plan, AHLA planned to "[e]xpand the association's impact on Capitol Hill by raising $1.5 million for HotelPAC for the next three years." AHLA has partnerships with related industry lobbying groups, including the National Restaurant Association, International Franchise Association, National Business Travel Association, U.S.Travel Association, Real Estate Roundtable, and others. AHLA spent $1,404,376 on lobbying at the federal level in 2014, slightly up from $1,328,000 in 2013. $300,000 went to two outside lobbying firms, Fierce, Isakowitz & Blalock ($200,000) and Janine Smith ($100,000), in 2014. AHLA's lobbying spending hovered between $1.2 million and $1.4 million annually from 2008 through 2014. American Hotel and Lobbying Association $1,404,376 See below. H2B Regulation, Wage Methodology for the Temporary Non-agricultural Employment H2B Program; Temporary Non-agricultural Employment of H-2B Aliens in the United States; Wage Methodology for the Temporary Non-Agricultural Employment H2B Program, Part 2; Labor Rulings and Appointments; OFCCP Section 503 Regulations, provisions related to hiring of person with disabilities; H.R. 1120, Preventing Greater Uncertainty in Labor Management Relations Act, all provisions. H.R. 4320, Workforce Democracy and Fairness Act, all provisions ; H.R. 4321, Employee Privacy Protection Act, all provisions ; S.2178, Workforce Democracy and Fairness Act, all provisions ; S.1737, Minimum Wage Fairness Act, all provisions; S.2223, Minimum Wage Fairness Act, all provisions ; H.R. 1010, Fair Minimum Wage Act of 2013, all provisions. H.R.4238, To amend the Immigration and Nationality Act to provide for requirements for employers of H-2B nonimmigrants, and for other purposes, all provisions; H.R.15, Border Security, Economic Opportunity, and Immigration Modernization Act, all provisions; S.2218, Subnational Visa Waiver Program Act of 2014, all provisions. S.701, Forty Hours Is Full Time Act of 2013, all provisions; S.1188, Forty Hours Is Full Time Act of 2013, all provisions. Issues relating to implementation of 15 USC 8001, Virginia Greame Pool and Spa Safety Act, all provisions, implementation compliance obligations of safety provisions for public pools and spas; H.R. 777, ADA Notification Act of 2013, provisions relating to notification of violations. Online Travel Company Taxation, taxation of hotel room reservations made over the Internet; Emergency Services Dialing procedures; S.1364, Digital Goods Act; H.R.3724, Digital Goods and Services Tax Fairness Act of 2013. H.R. 777, ADA Notification Act of 2013, provisions relating to notification of violations. H.R. 508, Terrorism Risk Insurance Act of 2002 Reauthorization Act of 2013, all provisions; H.R. 2146, Terrorism Risk Insurance Program Reauthorization Act of 2013, all provisions. S.1612, Patent Litigation Integrity Act of 2013, all provisions; H.R.2024, End Anonymous Patents Act, all provisions. H.R. 3286 The Protecting States Opening National Parks Act, all provisions; S.1572, Protecting States Opening National Parks Act, all provisions; H.R. 3661 The Public Access to Public Lands Guarantee Act, all provisions; S. 1750 Public Access to Public Lands Guarantee Act, all provisions; S.2104, National Park Access Act, all provisions. AHLA's affiliated PAC is the American Hotel and Lodging Association PAC, also known as HotelPAC. Its treasurer is Joori Jeon, who is also executive vice president and chief financial officer of AHLA and president and COO of the American Hotel & Lodging Educational Foundation. In 2014, HotelPAC raised $643,905 and spent $729,100, leaving it with $156,653 cash on hand at the end of the year. HotelPAC made contributions to over 100 individual candidates, 61 percent to Republicans and 39 percent to Democrats. AHLA holds an annual "action summit" in Washington, D.C., saying on its website that the summit is "the most effective way to voice the strength of the lodging industry to key policymakers in Washington, and in recent years we have seen direct and impressive results from our visits to Capitol Hill." The 2015 summit was co-organized for the first time with the National Restaurant Association and scheduled to be held April 14-15, with a focus on organizing attendees en masse to meet with officials on Capitol Hill. In February 2015, Politico reported that AH&LA, along with the International Franchising Association, the U.S. Chamber of Commerce, and other groups were creating a coalition "to encourage lawmakers on the Hill to oppose the National Labor Relations Board general counsel’s new joint employer standard. The Coalition to Save Local Businesses will launch an advertising campaign in D.C. and elsewhere to get out its message opposing a new standard." John Fitzpatrick, Chair. CEO, Fitzpatrick Hotel Group. Jim Abrahamson, Vice Chair. CEO, Interstate Hotels & Resorts. Mark Carrier, Secretary/Treasurer. President, B.F. Saul Company Hospitality Group. Katherine Lugar, President and CEO of AHLA. Lugar was previously executive vice president, public affairs for the Retail Industry Leaders Association (RILA), vice president of legislative and political affairs at the National Retail Federation, and as vice president of federal government relations at Travelers Insurance. Her official biography touts her being "instrumental in doubling the size of the Retail Leaders PAC" and "overseeing successful efforts to block major pro-labor initiatives" while at RILA. On Lugar's hiring in 2013, AHLA Chairman Ronald Vlasic said, "We have asked her and she has agreed to transform AH&LA by significantly strengthening its government affairs and public relations programs. She’s superbly qualified to do so." List of "Brand Representatives" available here. List of Executive Committee members available here. ↑ 1.0 1.1 AHLA, "About Us, organizational website, accessed December 30, 2014. ↑ 2.0 2.1 David Zahniser and Emily Alpert Reyes, "Industry groups sue over L.A.'s minimum wage for hotel workers," L.A. Times, December 16, 2014. Accessed March 12, 2015. ↑ 3.0 3.1 3.2 3.3 3.4 3.5 3.6 Mary Bottari and Jonas Persson, "Hotel Lobby Sues Los Angeles to Block “Extreme” Wages," Center for Media and Democracy, PR Watch, January 12, 2015. Accessed March 12, 2015. ↑ 4.0 4.1 4.2 AHLA, "2013 Strategic Plan," organizational publication, accessed December 30, 2014. ↑ 5.0 5.1 5.2 5.3 Ed Pilkington, "How a powerful rightwing lobby is plotting to stop minimum wage hikes," The Guardian, February 20, 2015. ↑ "Complaint in minimum wage case," archived by Fox Rothschild, accessed March 19, 2015. ↑ Matt Potter, "National hotel lobby funded wage referendum," San Diego Reader, November 6, 2014. Accessed March 19, 2015. ↑ Kevin Bogardus, "Hotel industry vows to fight back against ‘extreme’ minimum wage bills," The Hill, January 27, 2014. Accessed March 19, 2015. ↑ John W. O'Neill, "Extreme Wage Initiatives & the Hotel Industry: Impact on Local Communities and the Nation," American Hotel & Lodging Association report, June 2014. ↑ John W. O'Neill, Curriculum Vitae, accessed February 5, 2015. ↑ AHLA, "Brand Guidelines," organizational guidelines document, accessed December 30, 2014. ↑ 12.0 12.1 12.2 American Hotel & Lodging Association and WageWatch, Inc. "AHLA Survey," survey report, September 2014. ↑ Amy K. Glasmeier and the Massachusetts Institute of Technology, Living Wage Calculator, website, accessed February 5, 2015. ↑ U.S. Bureau of Labor Statistics, "Hotel, Motel, and Resort Desk Clerks," Occupational Employment and Wages, May 2013. ↑ Bureau of Labor Statistics, "Maids and Housekeeping Cleaners," Occupational Employment and Wages, May 2013. ↑ AHLA, Legislative & Regulatory Issues, organizational website, accessed December 30, 2014. ↑ 17.0 17.1 17.2 AHLA, "Issue Brief: Labor," organizational document, accessed December 30, 2014. ↑ AHLA, "Issue Brief: Healthcare Implementation," organizational document, accessed December 30, 2014. ↑ AHLA, "Issue Brief: Immigration Reform," organizational document, accessed December 30, 2014. ↑ Center for Responsive Politics, American Hotel and Lobbying Association, Open Secrets lobbying database, accessed February 3, 2015. ↑ Center for Responsive Politics, American Hotel and Lobbying Association, lobbying profile, Open Secrets database, accessed February 3, 2015. ↑ American Hotel and Lodging Association, First Quarter Lobbying Report, Lobbying Disclosure Electronic Filing, submitted by Joori Jeon April 18, 2014. ↑ Center for Responsive Politics,HotelPAC, Open Secrets political spending profile, accessed February 5, 2015. ↑ AHLA, "2015 AH&LA Legislative Action Summit, organizational website, accessed February 6, 2015. ↑ AHLA, "2015 AH&LA Legislative Action Summit Agenda, organizational website, accessed February 6, 2015. ↑ Brian Mahoney, "Public sector unions under attack again — GOP tries to stall NLRB election rule — Sens. urge end to port dispute," Politico, Morning Shift blog, February 10, 2015. ↑ AHLA, "Directors," organizational website, accessed December 30, 2014. ↑ AHLA, "Katherine Lugar," organizational biography, accessed February 6, 2015. ↑ AHLA, "KATHERINE LUGAR NAMED CEO OF AMERICAN HOTEL & LODGING ASSOCIATION," press release, date unknown, accessed February 6, 2015. ↑ AHLA, "Staff Directory," organizational website, accessed December 30, 2014. This page was last edited on 11 October 2017, at 18:55.